Snoring is a very common condition that has a tendency to get worse as we age. Men suffer from the problem more frequently than women, but it is very common in people who are overweight. In most cases snoring is not much of a problem , but more of a nuisance. However, if it is severe, it will disrupt the sleep patterns of those close to you, as well as your own sleep quality. The cause of snoring is very straight forward: air flow through the mouth and nose is obstructed. Generally, obstructed nasal airways are one of the major causes of snoring. A deviated septum, nasal polyps or a sinus infection all can block air flow which will result in snoring. Muscle tone in the throat and tongue, if it is not firm, will allow these muscles to relax too much and they will block the air way. This problem can be caused by deep sleep, alcohol consumption, use of certain sleeping pills and aging. Throat tissue which is large and bulky, often a problem with overweight individuals, can result in snoring. Along this same line, children with large tonsils or adenoids will often snore. The combination of a long soft palate and a large uvula, will also cause snoring. The structures will vibrate and touch one another which closes the airway, and produces snoring. In addition to the noise created by snoring, which is irritating, you might also suffer from excessive daytime sleepiness, a sore throat, restless sleep, gasping or choking at night. All of these are not good for you or your sleeping partner. One of the great problems with snoring, is that over time it can become a health risk factor. In many cases ,obstructive sleep apnea developes from habitual snoring, and this is a serious health issue. Sleep apnea can cause high blood pressure, enlargement of the heart , which could cause heart attacks or strokes. Snoring and some mild forms of sleep apnea can be treated with oral appliances made by a dentist . I am sure you know about many of the devices sold in pharmacies or discount stores. These are like mouth pieces, and in most cases and can actually make additional problems for your teeth and jaw. The appliances made by the dentist all work by moving your lower jaw forward. This opens the airway in your mouth, keeping the airflow from being blocked. They are custom-made for your mouth and can be adjusted as necessary to help control your snoring. Some cases of mild sleep apnea can also be treated with these devices since an open airway also treats sleep apnea. So, get some help with your snoring and make everyone in the house happy. Everyone will enjoy a better nights rest and feel better in the morning. The office receives a great number of questions about teeth in children and when they should first appear and what to do about certain problems children have with their teeth. So, in this blog, I will address some of those questions and concerns. First, children have two sets of teeth, primary(baby) teeth, and permanent (adult) teeth. All teeth are important for speech, chewing and give the face structure. In addition, the primary teeth help children develop the muscles necessary for chewing and also act as placeholders for the permanent teeth, which erupt later in life. The first primary tooth will usually erupt around the age of 6 months. After that happens, the parents should brush the child’s teeth twice daily to prevent tooth decay. Generally, at 2 years of age, all 20 primary teeth will erupt. Parents should continue to brush the child’s teeth until he or she is able to avoid swallowing the toothpaste. One common misconception of parents is that primary teeth do not require dental care since they are temporary and will eventually be replaced by permanent teeth. If a primary tooth is lost before the scheduled time of eruption of its permanent successor, it is likely the space will reduce in size, or even close due to drifting of near by teeth, which can cause the permanent tooth to grow in crooked. A baby tooth which has a large cavity which is not treated, can abscess. This infection can actually harm the permanent tooth which is developing under the baby tooth. The primary teeth are lost between 7 and 12 years of age and are replaced with permanent teeth. This phase of development is typically referred to as the “mixed dentition” stage because children have both primary and permanent teeth. 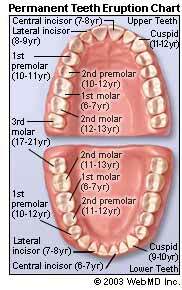 There are a total of 32 permanent teeth; the additional 12 teeth will erupt behind the primary teeth and are called the molars. All permanent teeth erupt by the age of 14 with the exception of the “wisdom teeth” or third molars that erupt between the ages of 17 and 25. Not everyone develops “wisdom teeth”, but those of us that do typically have them removed for one reason or another. Usually because they are so far back in the mouth and are often difficult to properly clean. This does not interfere with chewing as the “wisdom teeth” are not generally used for chewing. That is a quick over view of the primary or “baby” tooth story. The most common question or concern that parents express is when the lower permanent front teeth begin to erupt. It can look strange, like the child is actually getting a second set of teeth behind the front baby teeth. Actually, what you see are the two permanent teeth erupting behind the baby teeth. As the permanent teeth come in, they will move forward and actually “push” the baby teeth out. 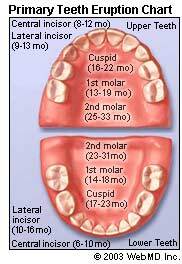 The pictures should help with the “average” time-table of when baby and permanent teeth should appear in a child’s mouth. It can vary by months, so do not get too concerned if your child seems a bit slow with his tooth development. If you are worried, the dentist can take an x-ray and show you the permanent teeth developing in your child’s mouth. Recently, the natural sweetener xylitol, has been getting a great deal of attention from the dental world and the nutrition and health food worlds as well. Xylitol, is a natural sweetener found in fibers of many fruits and vegetables and can also be found in oats, mushrooms and corn husks. Xylitol was discovered by German and French chemists in the late 19th century and has been used in Europe primarily as a sugar alternative for diabetics. In the early 1970’s,researchers in Finland discovered the dental benefits of xylitol, since that time many more studies have been conducted. These studies have linked xylitol to a reduction in the bacteria that can lead to cavity formation. The way xylitol works is quite interesting. The bacteria in your mouth mistake xylitol for their favorite food, fructose. The bacteria transport xylitol through their cellular walls to metabolize it as a food. 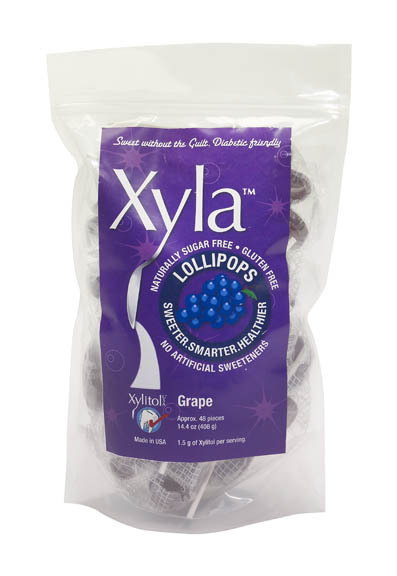 Xylitol is a five carbon sugar alcohol, which during this process of transportation is changed into xylitol phosphate. The bacteria are not able use this substance as a food. Over time, the xylitol phosphate accumulates inside the bacteria, creating a toxic effect. The bacteria become starved, and may eventually die. This results in a reduction of the number of cavity causing bacteria in your mouth. However, the long-term presence of xylitol in the oral cavity can lead to an increase number of xylitol-resistant bacteria. This is actually a good thing since these bacteria are not as strong as their cousins and are not as capable of producing tooth decay. They also lack the ability to produce the necessary acid to adhere to your teeth. This means there will be less plaque on your teeth. There is some evidence that suggests the use of xylitol can aid in the repair of damaged tooth structure by creating bacterial changes; creating an ideal environment for remineralization to occur. Remineralization is the natural process of restoring minerals to a tooth that have been damaged by the acidic activity of bacteria. Think of it as replacing the missing rungs in an old rickety ladder, making it strong and stable again. While nothing can replace brushing and flossing xylitol use can be another means of combating tooth decay. Research suggests you need to consume between four and twelve grams of xylitol a day to experience the positive effects. Xylitol can be purchased in many different forms, such as chewing gum, various candies, sweetener packets for your coffee or tea, or in bags just like sugar. It is not difficult to find, most health food stores carry it, as well as a number of internet sites. It can be a little pricey, but if you have high rates of tooth decay it can help with the problem. Another cooking/frying article just to keep things interesting. This recipe can be used with venison if you are a hunter just as easily as with the beef version of cube steak. It is easier to work with the cube steak if it is still a little frozen. You will need to cut it into bite size pieces, about one inch square to one and a half inches. Take your steak pieces and place them in a pan or bowl. You will need to mix sour cream (it can be low-fat) and some brand of spicy mustard with the meat. It has to be completely covered by the sour cream/mustard mixture so somewhere between a half pint to maybe a pint of sour cream and then one to two average size bottles of the spicy mustard. I normally use Grey Poupon mustard so you can substitute something similar. Cover the meat and marinade with wax paper or saran style wrap and refrigerate for 12 to 24 hours. One other thought about the sour cream and mustard for the marinade– I add about a teaspoonful of Cumin to the mixture. This adds a nice subtle flavor, but you can leave this out if you want. After you have marinated the meat and you are ready to fry, you will need to coat the meat in flour. Now from a previous post, you know that I am a big fan of House of Autry flour especially the fish breader either mild or hot. You can use regular flour which you add some salt and pepper to, but House of Autry is already seasoned. Take the pieces of meat and coat them with flour with whatever method you like. You can use a bowl with the flour in it and sort of dredge the pieces through it , or shake them in a paper bag or use the Bill Dance fish breader. Make sure your peanut oil is 375 degrees and fry until golden brown. Watch the oil temperature as it will drop as you fry. Remove the meat and let in drain on a rack or paper towels and if you want you can season them with a bit of sea salt. Let them cool and enjoy.